In a bowl, whisk soy sauce, rice wine, hoisin sauce, honey and sesame oil together; set aside. Heat the oil in a medium saucepan over med-high heat. Add the star anise and the peppercorns; cook, stirring until toasted, about 10 seconds. Add the cilantro, green onions and garlic and cook 30 seconds. Add the soy sauce mixture and simmer over medium heat until slightly reduced, 2-3 minutes. Remove from heat and let cool. Place chicken in an extra large freezer bag. Pour hoisin mixture over chicken and toss to combine. Refrigerate for at least 4 hours, or overnight. Transfer chicken to a rack set in a roasting pan (reserve the marinade). 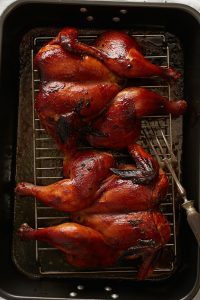 Refrigerate the chicken, uncovered, for about 3 hours to dry out the skin (this makes it crispy). Position a rack in the upper third of the oven preheat the oven to 400 degrees F. Pour ¼ inch of water and the reserved marinade into the roasting pan. Roast the chicken for 20 minutes. 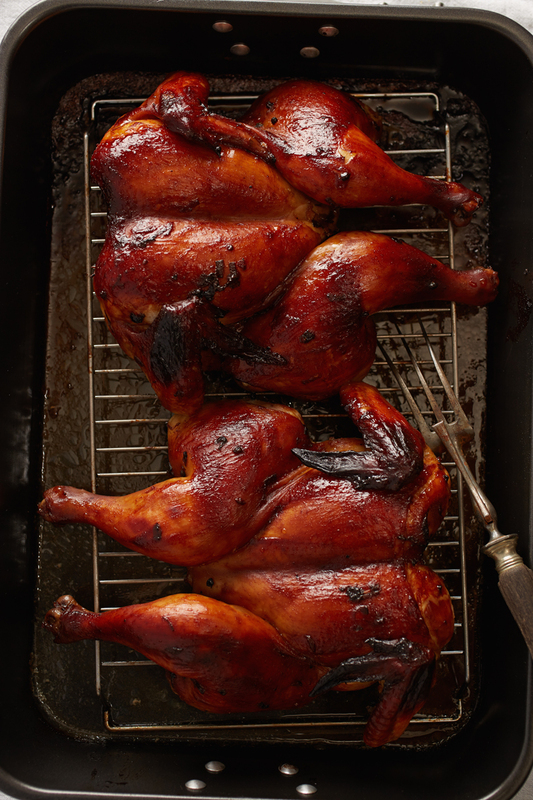 Baste with the pan juices, then reduce oven temperature 350 degrees F, 20 to 25 more minutes. Remove from the oven and let rest for 15 minutes. Cut up the chicken and remove the bones. Discard the bones. Slice the meat and skin. Pour the pan juices into a skillet; bring to a boil and cook until reduced by half, about 5 minutes. Transfer chicken to a large platter. 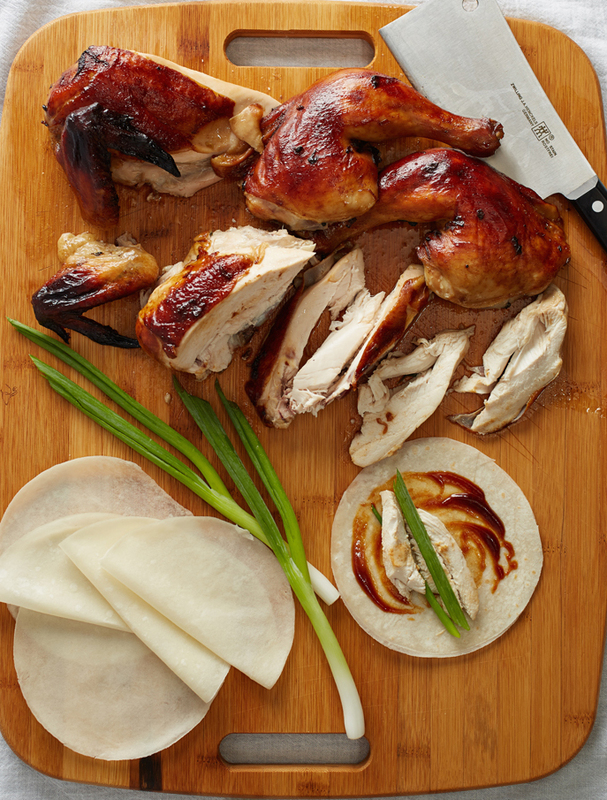 Drizzle juices over the chicken, serve with pancakes, cucumber, green onions, sriracha and hoisin sauces. To assemble spread hoisin sauce and sriracha sauce (to taste) over a Moo Shu pancake. Place pieces of chicken and skin, green onions, and cucumber on top and roll up pancake. Variation: Use bone in chicken pieces instead of whole chickens. Serve with jasmine rice garnished with green onions and cucumber. Notes: Look for Szechuan peppercorns at bulk food stores or Asian grocery stores. Moo Shu, or Mandarin pancakes, are available in Asian grocery stores. They may be in the freezer section. Crepes are a great substitute.